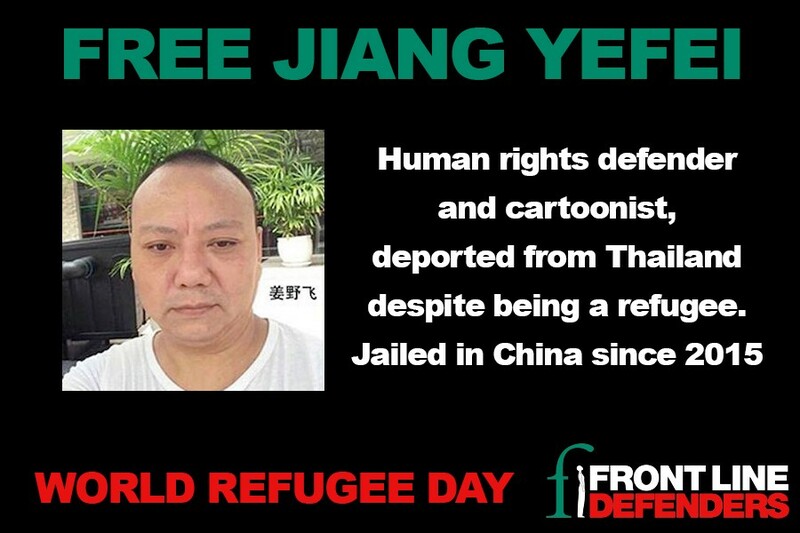 Human rights defender and cartoonist Jiang Yefei fled China in 2008, when his home country became too dangerous for him and his family. In the aftermath of a devastating earthquake in Sichuan province in May that year, Jiang gave interviews to foreign media criticising the Chinese government’s failure to adequately deal with the emergency. Soon after, Jiang was jailed and tortured. After his release, he flew to Bangkok with his family, fearing he would be arrested again or his family harmed. The Chinese state is known for its reprisals on activists’ families. In Thailand, Jiang continued his rights work and he became the Chairperson of the Thai branch of the Federation for a Democratic China. Almost seven years later, in April 2015, the United Nations High Commissioner for Refugees (UNHCR) granted refugee status to Jiang and his family. They thought the worst was over, and they were ready to start a new life. But on 28 October 2015 Thai police arrested Jiang and another Chinese HRD in exile, Dong Guangping, for not having valid visas, despite the fact that they were both registered as refugees. On 15 November, only a few days before they had planned to relocate to Canada, the two HRDs were sent back to China. Ten days later, Chinese state TV broadcast Jiang’s forced confession, in which he “admitted” guilt to charges of ‘human trafficking’. The human rights defender was held incommunicado for months until an arrest warrant was formally issued for “inciting subversion of state power” and “making arrangements for another person to illegally cross the national border”. Since then, he has been detained in Chongqing. According to his sister, who recently managed to speak with him over the phone, he is suffering from eye problems, likely due to ill-treatment in prison. Despite hosting tens of thousands of refugees from neighbouring countries, Thailand doesn’t have an adequate refugee policy and it has refused to sign the 1951 UN Refugee Convention and its Protocol. The lack of legal protection can be particularly dangerous for Chinese HRDs. In recent years, dozens of activists have been deported from Thailand and repatriated against their will. Jiang’s wife, Chu Ling, is now living in Canada. She is advocating for her husband’s release, urging the international community to condemn China for his imprisonment and Thailand for allowing his deportation. On World Refugee Day, show your support for Jiang Yefei and share his story.